Note: These California newspaper articles mostly relate to the Central Pacific Railroad, including the visit of Vice President Colfax. 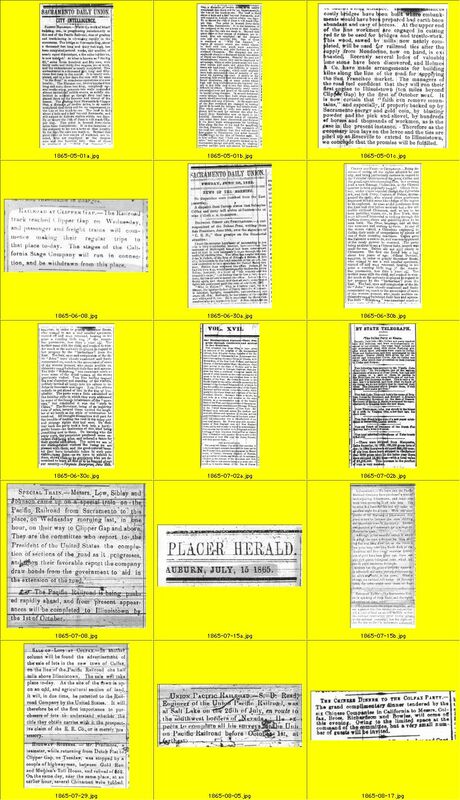 They were published in 1865 or 1866 in the Sacramento Daily Union, Alta California, Placer Herald (Auburn), or the Dutch Flat Enquirer. They are arranged in chronological order with the date of publication shown at the top of the window in the format yyyy-mm-dd. Click here to see transcribed copies of these newspaper articles. Courtesy G. J. Graves, Newcastle, California. Copyright © 2001, CPRR.org. [Last updated 3/3/2001] Use of this Web site constitutes acceptance of the User Agreement; Click any image or link to accept.